As Israeli forces intensify their campaign to put an end to the terrorist rocket threat emanating from Gaza, the Israel Defense Forces (IDF) are taking unprecedented steps to avoid civilian casualties, often at the cost of successfully completing their missions. "For your own safety, take responsibility for yourselves and avoid being present in the vicinity of Hamas operatives and facilities and those of other terror organizations that pose a risk to your safety. Hamas is once again dragging the region to violence and bloodshed." Sadly, Hamas and its allied terror groups have a cynical disregard for all life, even the lives of Palestinians, and seems to actively seek civilian casualties for use in the public relations battle to delegitimize Israel. 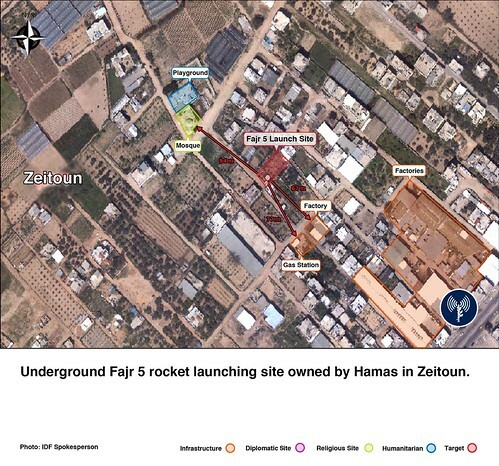 The following image posted by the IDF shows a Hamas missile launch site situated in the middle of a civilian neighborhood a very short distance from a local mosque and adjacent kindergarten. Despite Hamas' best efforts, the IDF's policies have paid off, and, while every civilian casualty is tragic, the ratio of civilian deaths to combatants killed in Gaza is unprecedentedly low. "The UN estimate that there has been an average three-to-one ratio of civilian to combatant deaths in such conflicts worldwide. Three civilians for every combatant killed. That is the estimated ratio in Afghanistan: three to one. In Iraq, and in Kosovo, it was worse: the ratio is believed to be four-to-one. Anecdotal evidence suggests the ratios were very much higher in Chechnya and Serbia. In Gaza, it was less than one-to-one."